Before you mess with the derailleur, consider other potential sources of your poor shifting problem. If the rear shifter works properly when using the large chain ring but not the small chain ring, or vice-versa, then the rear derailleur hanger might be bent. If the shifting skips when you apply pressure, check that your chain and cassette are not worn. If the shifting skips every third or fourth pedal revolution, check for a tight chain link. If the shifting skips when you go over a bump, and you are riding a full suspension bike, check that your cable housing is long enough. It may be stretching as the suspension flexes, causing the gears to ghost shift at that time. Dirty, rusty, kinked or damaged cables and cable housing will also make shifting a problem. Index shifting is very sensitive to excessive friction in the cable. Having ruled out these sources of concern, follow this procedure to adjust your shifting. First check the derailleur’s range of motion. The high and low gear limit screws determine how far the derailleur can shift to the left and right. Too far to the left, and your chain ends up in the spokes. Too far to the right, and it ends up grinding away your dropout. Usually the screws are labeled H and L, but if not, high is typically on top, low is on the bottom. I once had a derailleur labeled I and J … until I turned it clockwise 90 degrees! To check the leftmost range of motion, put the bike into the smallest front chain ring and the lowest rear gear (largest cog). Looking from behind the bike, the pulley wheels should be directly beneath the largest rear cog. Now shift to the largest front chain ring, and the highest rear gear (smallest cog). Looking from behind, the pulley wheels should line up just slightly to the right of the smallest rear cog. If the pulley wheels don’t line up, use the appropriate gear limit screw (H = High = highest rear gear = smallest cog) to move the derailleur. You will see the pulley wheels move when you turn the screw. For both adjustments, counterclockwise turns typically let the pulley move further; clockwise turns limit its movement. So far, we have only physically adjusted the position of the derailleur. Now we have to adjust the cable tension. As a first check, shift to the smallest rear cog. The tension on the cable should be minimal at this point – just enough to take up the slack. If you had problems adjusting the range of motion for the high gear, a cable that is too tight could be the problem. Also check that the cable runs correctly through the cable attachment point. 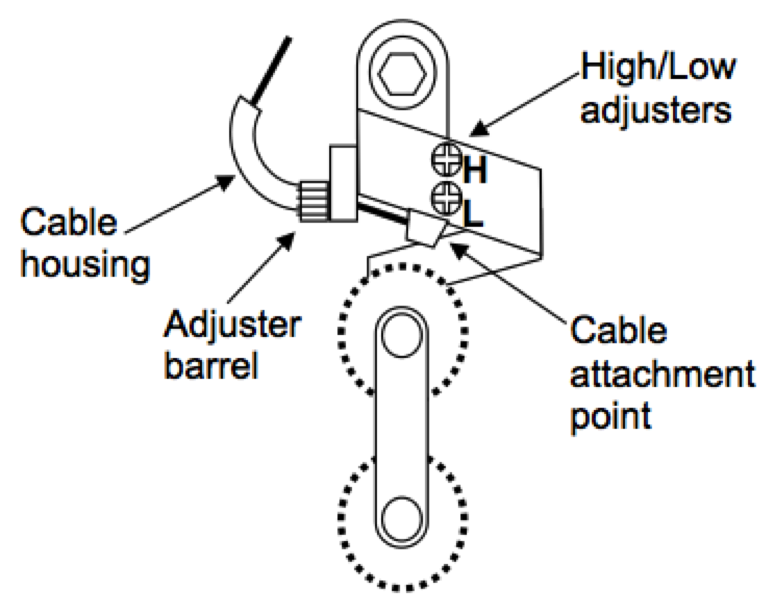 Most derailleurs have an indentation for the cable to follow underneath the fixing bolt, and even a slight deviation from this route will change the shifting characteristics of the system. Now, while holding the bike off the ground, turn the pedals and push the shifter lever through one click. The chain should move to the second-smallest cog in less than one revolution and run quietly. If it hesitates, screw the adjustment barrel counterclockwise half a turn and retry. If it shifts too far, screw the barrel clockwise half a turn. Repeat until it shifts smoothly. Now shift through all the gears, both up and down. Some full suspension bikes work differently with rider weight on them, so test ride, shifting through all the gears again. When you turn the barrel adjuster counterclockwise, you are tightening the cable (well, making the housing longer, which has the same effect). When you turn it clockwise, you are loosening the cable. The front derailleur follows the same basic procedure. Check the high and low limit screws, and then use the barrel adjuster on the shifter lever to make sure the chain moves from the small to middle ring smoothly. Don’t over-correct with the barrel adjuster. Doing so may make the shifting work, but one “click” off, so either the highest or lowest gear isn’t accessible. Over time, cables stretch. The most common adjustment is to turn the barrel adjuster counterclockwise a quarter turn to take up this slack. Rapid Rise rear derailleurs work almost the exact opposite way to the description above. Start in the largest rear cog, where the cable should be at its loosest. Now shift to the next gear but follow the same instructions as above – the cable still needs to be tightened if it hesitates or doesn’t shift far enough. Some higher end derailleurs (SRAM X0, Shimano XTR) don’t have a barrel adjuster on the derailleur. However, almost all handlebar mounted shifters have the adjuster, so you can make your adjustments at that end of the cable if necessary. Turn the same way as you would at the derailleur. Don’t mess with the B tension adjuster (screw which pushes against the derailleur hanger or dropout) – it’s unlikely that this will help much in any adjustments, or that it has gone out of adjustment. It’s mainly designed to keep the top pulley wheel free of the largest rear cog.